It is our sincere pleasure to extend a long over due “Thank You” to Willa Wells and Sharon Boone. 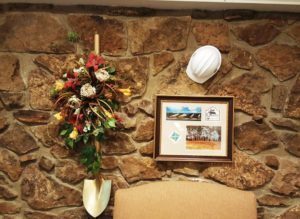 They have created a wonderful display marking the launch of Osage Point Development and the official ground breaking ceremonies. October 18, 2016 was a grand day that was well attended by Federal, State and Local officials, including a large number of Fairfield Bay residents. The display can be viewed in the front lobby of the Fairfield Bay Community Club Office. The next time you are there, take a look. When you have a minute, you are welcome to stop by our offices on Hwy 16, and look at the new products display room for the Osage Point Townhomes, that is almost complete.